I have no idea what their observationdeck is called, hackerspace? How do I post there? Anyways, I don't know if anyone can help me out here. A few years back there was this app, Mac Entourage which was largely hated. I didn't like Entourage itself, per se, but it had its uses. But what I really liked about it was "My day." 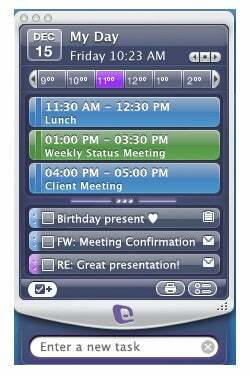 It was a secondary app that looked like a little planner. You could quickly add tasks, events and also check them off. You didn't have to open Entourage. I synced it with ical, etc, it was amazing. Things would also show up on the little planner.
" My Day looks like a widget, but isn’t in Dashboard. It’s actually a companion application that can appear even if Entourage isn’t open; My Day displays your upcoming calendar events and To Do items. A hotkey makes My Day appear and disappear." Anyone know of something similar? Even a small app that floats on my mac screen, that can be synced with google/ical, and possibly even has an ipod/iphone equivalent. If you don't know of one for OS, but you do for Windows, well I have one of those too.